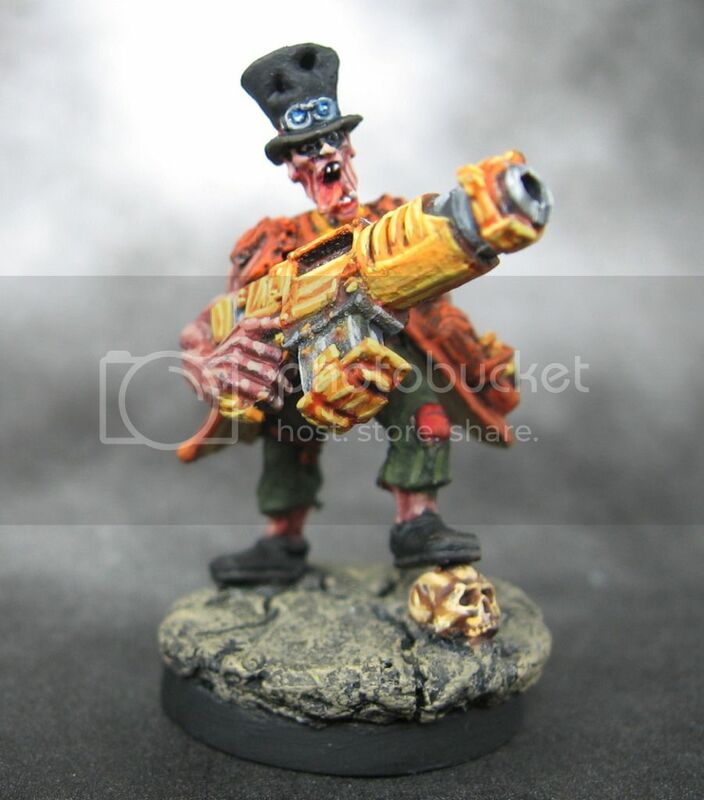 This model was a test model I quickly painted to test a colour scheme for a Necromunda Chaos Cultist squad. This model is one of the new plastic cultists from the Dark Vengeance box set. I speed painted it, only doing quick washes and few highlights. I have decided to discard this colour scheme, but I thought I would post up the model regardless. I've finished painting this commission for the Madrak Ironhide World Ender model for the Trolbloods faction from Hordes/Warmachine. I tried some new techniques for painting the skin and tartan on this model. 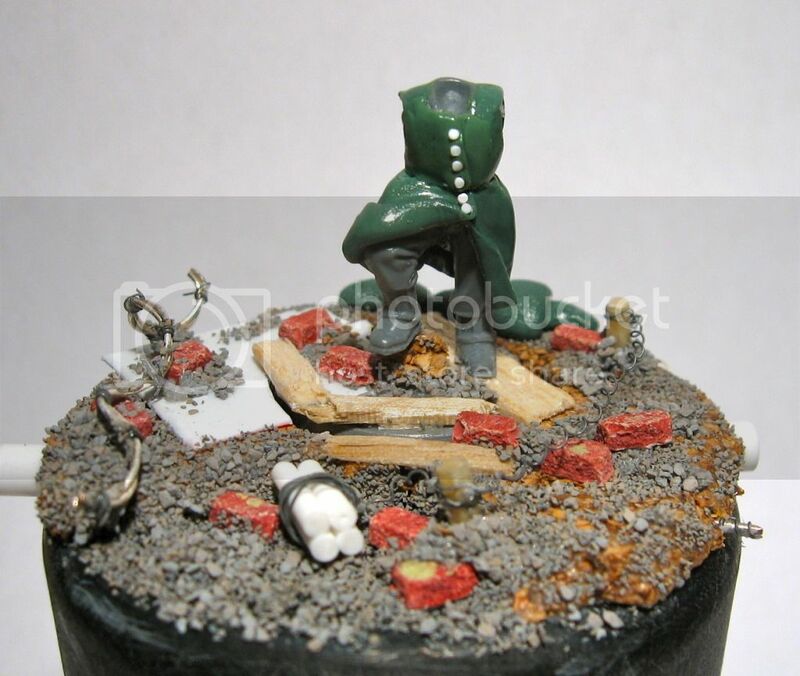 I enhanced the base by increasing the height of the model using cork and adding detail in the final basing. I've finished the painting of the first five shipping containers. In the first parts of this series I showed how to build shipping containers, how to paint shipping containers, and how to airbrush graffiti onto the models. 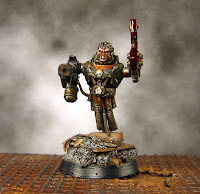 In this post I will show the first five completed models. I will show some pictures with models for scale. I will also show how they all nicely fit into a box for transportation and storage. A step-by-step guide to how I quickly painted my shipping containers. I used the same basic formula to paint all of the containers, only changing the base colour. This tutorial will show you how to quickly paint your shipping containers to a tabletop standard. To see how to build shipping containers, check out my post on building shipping containers. Also, please vote on my poll on the left for what you would like to see on this blog. 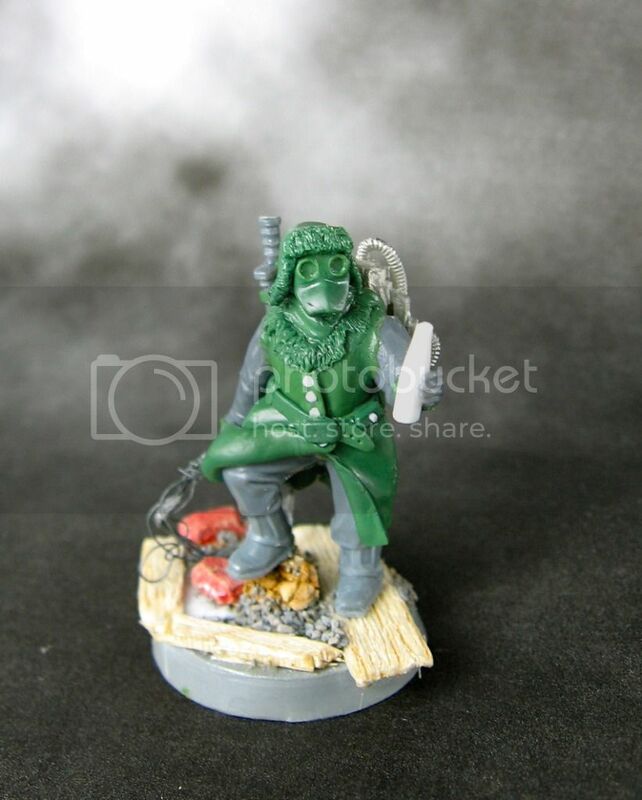 And now for something completely different; a foray into the world of 15mm warfare. There is a local group playing weekly Flames of War games. After checking out a game I decided to take the plunge and purchase Battlefront's excellent new Open Fire starter set. This model is a V-1 flying "buzz bomb". It is a terrain piece from the starter set. Today I experimented with airbrushing graffiti onto one of my shipping containers. I used a series of stencils I made to quickly do this. In this tutorial I will show some pictures of how to quickly achieve this effect. To see how to build the shipping containers check out my tutorial on building shipping containers. In this tutorial I will show you how I built 28mm scale shipping containers from basic materials. In this part I will show the materials you need and the steps for construction. In the next section I will show step-by-step how I painted the models. With this tutorial I will show the steps to build one shipping container. I would recommend building more than one at a time as it is much more time efficient. You can modify the designs to create new combinations of shipping containers with open doors and things. I would estimate that each shipping container takes a little under an hour to completely build and assemble. I finished painting this shipping container test model. I am building a set of modular storage containers as an easy to store set of terrain for modern and sci-fi games. The container is 5 cm high (2 inches), 5 cm wide and 12 cm long (5 inches). I have another 11 of these in progress. 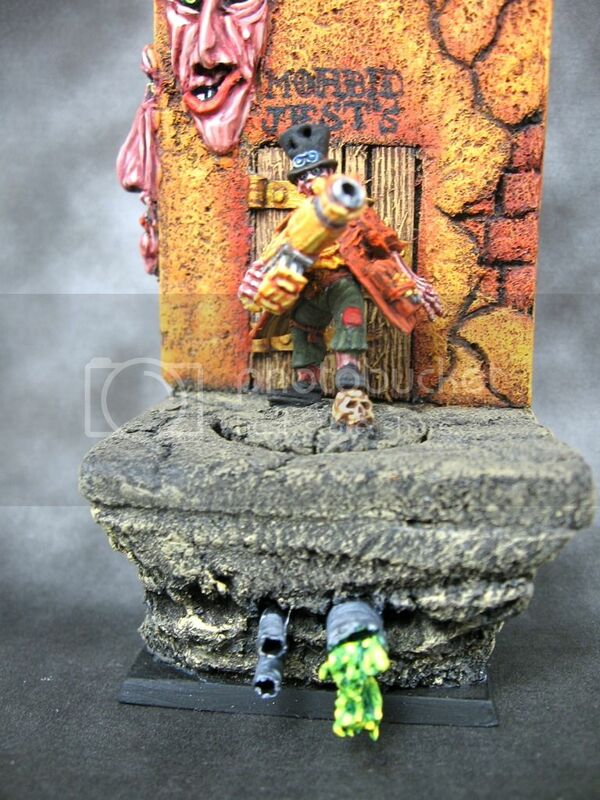 In a later post I will make a tutorial showing how to build these and then a tutorial on painting them. The wonderful sheet metal texture comes from a large sheet of corrugated card I found at an art store. It is great stuff to work with and (in my opinion) looks perfect at this scale. I tried using my airbrush to paint an Imperial Fist terminator. I used the airbrush to do most of the shading and highlighting on the armour. Everything that is not yellow was painted by hand using conventional techniques. I've finished painting my first Space Wolf terminator. After my experiments with airbrushing power armour in my last post, I decided to try using similar techniques to paint a Space Wolves Terminator. I used a similar technique for airbrushing the shadows and highlights. In addition, I masked off areas and airbrushed the yellow. Today I thought I would try to speed paint a terminator using my airbrush. I saw some great tutorials on Buy Painted's youTube channel and wanted to try them out. For this model I ended up doing about 60% of the work with the airbrush and then finished the model with standard brush painting. I've finally finished painted the two Ork Pirate Nobs I showed as works in progress a few weeks ago. Looking back, I can see it took me two months to get paint on these models. Terrible! Nevertheless, they are finished. In between "Rust and the city" became a better moniker for my apartment than this blog. I've been delayed by leaks and renovations. Now that it is resolved, expect to see more regular updates over the coming months. At long last I have finished painting these ork pirates. The models are pretty simple conversions on custom bases. You can see these models before painting here. Overall I am pleased with how the models turned out. I tried a new recipe (based on the new Waaagh Flesh) for the skin and I am pleased with how it turned out. The blends are fairly smooth in most places and the skin doesn't look like it would glow in the dark. I currently have some extra time on my hands and I am available for doing some custom commission work. If you are interested in getting some work done you can contact me through the contact form or by directly emailing me at rustandthecity at gmail.com. Due to the time I currently have available, I can currently offer quick turn around on projects. As you can see on this blog, I specialize in unique, custom models with a strong theme. Below I will show some examples of some of things I have done. 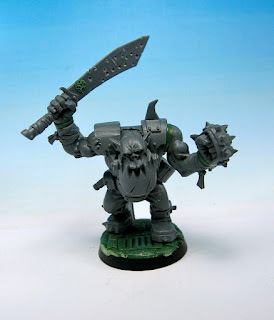 Here are some small conversions I have done for some pirate grots/gretchin to add to my pirate ork force. I've slowly been working on some additional bits for my Ork Pirate warband. It took a few tries, but I am nearly finished sculpting an octopus. 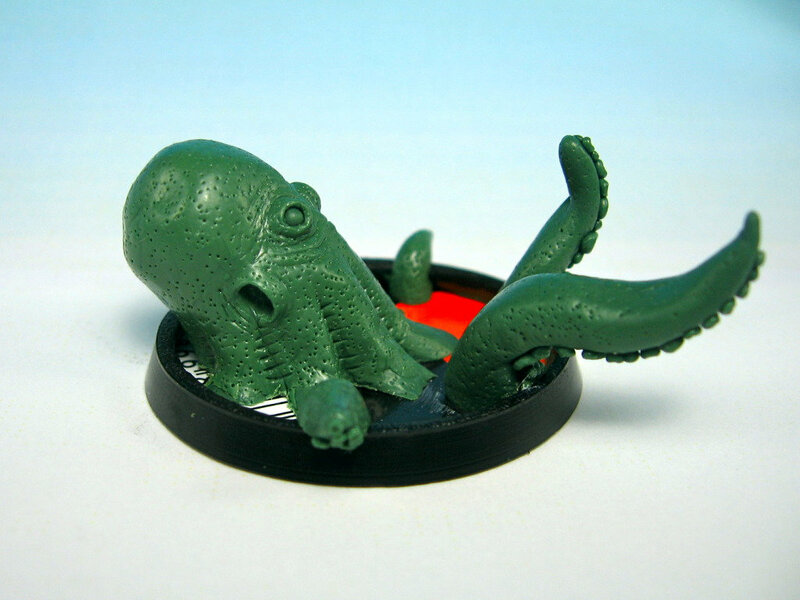 The Octopus will stand in for a troll in fantasy. THis is my first scratch sculpt. There is nothing but wire and greenstuff inside! I tried to build the model to look like it is rising out of the water. The final base will have water effects added to it. 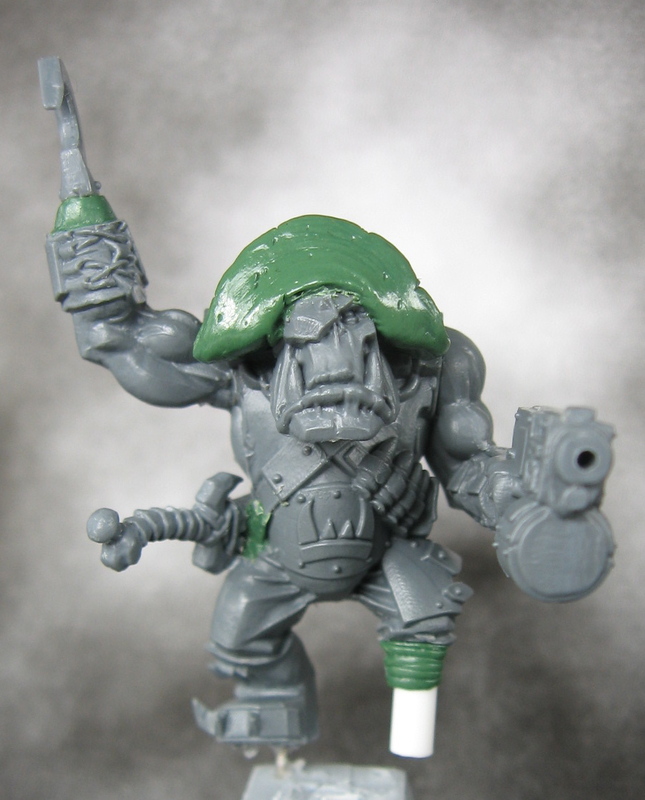 I've started some serious work on my pirate ork squad. 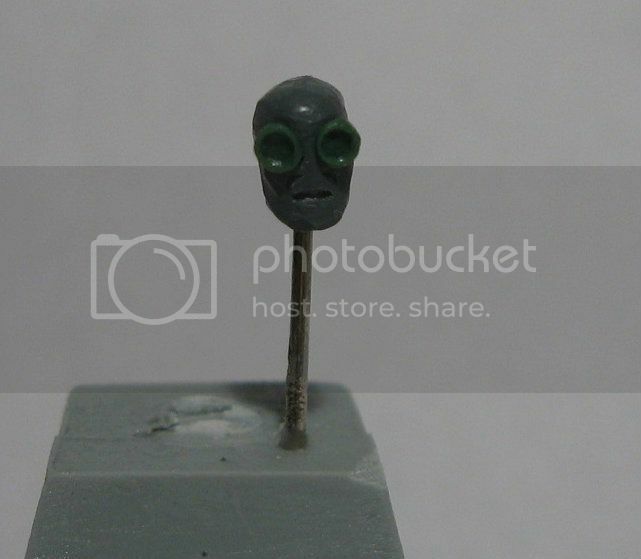 My plan is to make about 25-30 of these for use in both Mordheim and Deathsquads skirmish games. I've been working on little bits for many different projects and so I haven't been posting my work up on here. All of the models are unpainted at the moment. 2 orks with hand weapons and a grot. Usually I put characters on higher bases but for this squad I am going to use the bigger bases to showcase some of the grots and other smaller models. 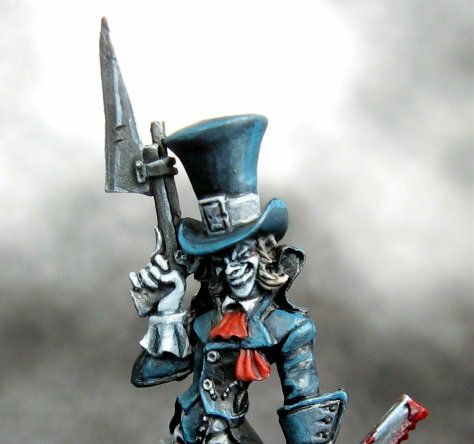 I've finally gotten around to painting some of my Red Chapel Gang for Malifaux. Seamus is finished (for now). The theme with this gang is that I want to paint them in an almost noir style, like Sin City. The only true colour on the models will be the graphic red highlights on the cloth and the red blood. I ended up highlighting the black with blue, so that did end up adding a lot more colour to the model than I had intended. It was a good exercise in blending, and I am moderately pleased with the result. It is not what I had intended, but it will be fine as a tabletop model. 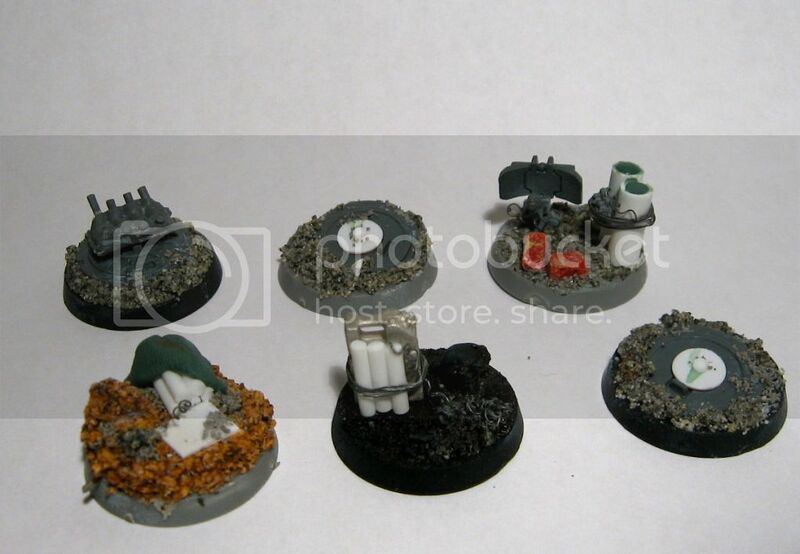 Here is a small set of bases I have sculpted for my pirate ork squad. I wanted to build a showcase set of bases sculpted from greenstuff. I used the press mold brick base tutorial I made a few months ago to create most of the stonework. I then added details like wooden planks, sewer grates, manhole covers, sidewalk, pipes, chains, and other items to spice them up a bit. These bases still need some sand added to them before they are completely finished. 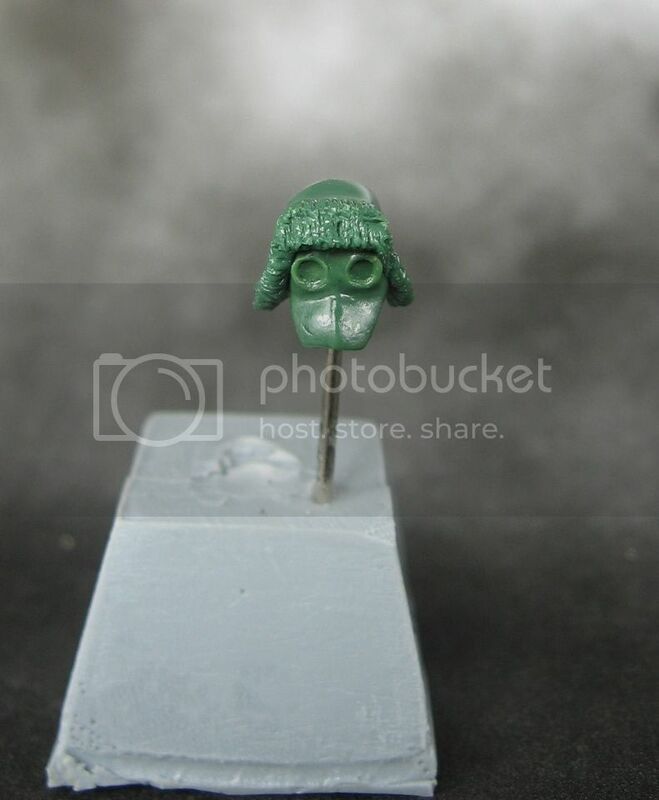 40mm round base for a troll. In the first part of Budget Miniature Photography I discussed my home photo booth and the costs of my set up. In this instalment I will show an experiment of the effect of lighting on picture quality. Just for some extra fun, I will write this in the format of a high school lab report. 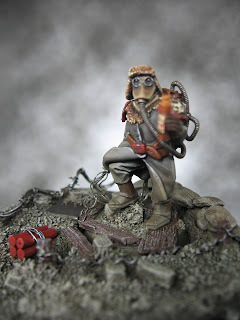 Miniature photography is a major aspect of hobby blogging. After all, how can you show off your great models to best effect without taking some decent pictures. 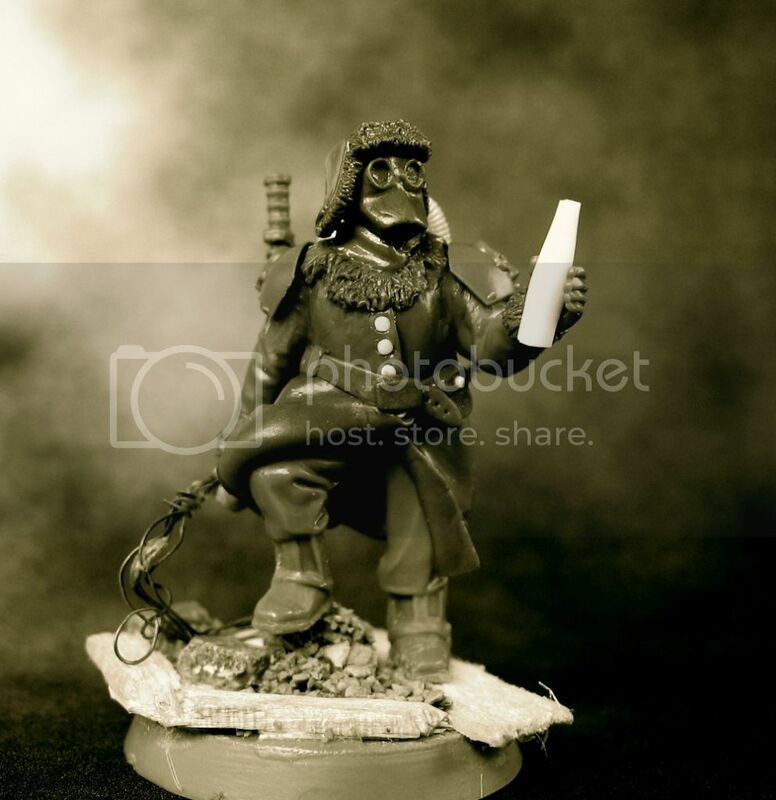 Stahly's Tale of Painters had a great article on miniature photography. Unfortunately, a similar setup is out of the price range and space constraints for many hobbyists. In this multi-part series I will show my set-up and what I have learned so far. This first part will show the tools I use. In part 2 I will show some experiments with different lighting. I spent some time today updating the blog template and making some banners. I need your help to vote on the banners and choose which should be used for the blog. Vote for the banners by clicking on the poll to the right. All of the banners are based on pictures I have taken and modified using photobucket and iPhoto. 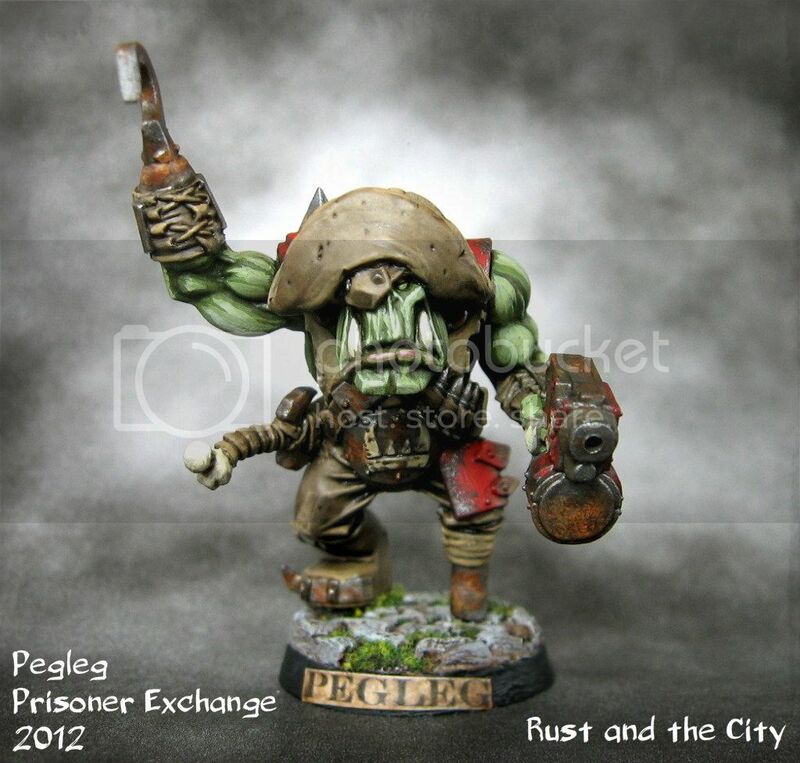 Here are some pictures of the finished Ork Pirate. 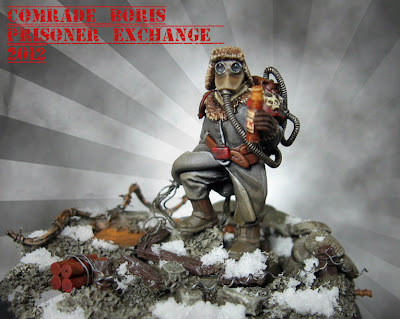 As I wrote in the WIP blog entry, this model was a bonus for the prisoner exchange. The model is based on an Assault on Black Reach Nob with some conversions. This model was done as a test for my upcoming Pirate Ork warband and was painted to fit the colours of Mordheimer's existing ork squad. As my prisoner was so delayed, I built an ork pirate while I was waiting for the sculpting to set on various parts of my demolition expert. The idea for a DS/Mordheim war band of ork pirates has been percolating in my head for a very long time. I bought all of the bits almost two years ago but haven't gotten around to assembling them yet. Fortunately, creating a bonus prisoner gave me the perfect excuse to create a test model. The model is based upon an Assault on Black Reach Nob. Finally! I've finished my demolition expert for the Deathsquads Prisoner Exchange. I've been working on this model for a few weeks and finally have everything complete and ready to post. Enough babble, here are some pictures of the final product. Demolition Expert diorama almost complete! At long last my prisoner is nearly complete. I added a light drybrush to the wood and realized that there are only finishing details left to do. All I need is a bit of airbrushed black on the base (to repair damage from when I masked the base) and add some rust to the metal on the base itself. I've gotten a bit of progress done on the demolition expert I have been working on for the prisoner exchange. As you can see in the pictures, I have basecoats, washes, and some rough highlights finished. I am planning to do another light wash and then some more fine edge highlights and then work on weathering and basing. I am hoping to have this project out the door by Wednesday. Last post I showed the prisoner I received, so you can tell how behind I am. Those who have been visiting this blog for a while have been hearing all about the DS Prisoner Exchange. The idea is that you build a model for another person on the forum and they build one for you. Unfortunately I am a little behind on my prisoner (who has been featured here the last few weeks). To my chagrin, I received my prisoner in the mail this weekend (and am still finishing my prisoner to post away). Those who frequent the wyrd forums, DS forums, or Tom's Boring Mordheim forum are no doubt familiar with DeafNala. He is a frequent contributor and commenter in those forums and has produced some fantastic models, dioramas, and scenery over the years. 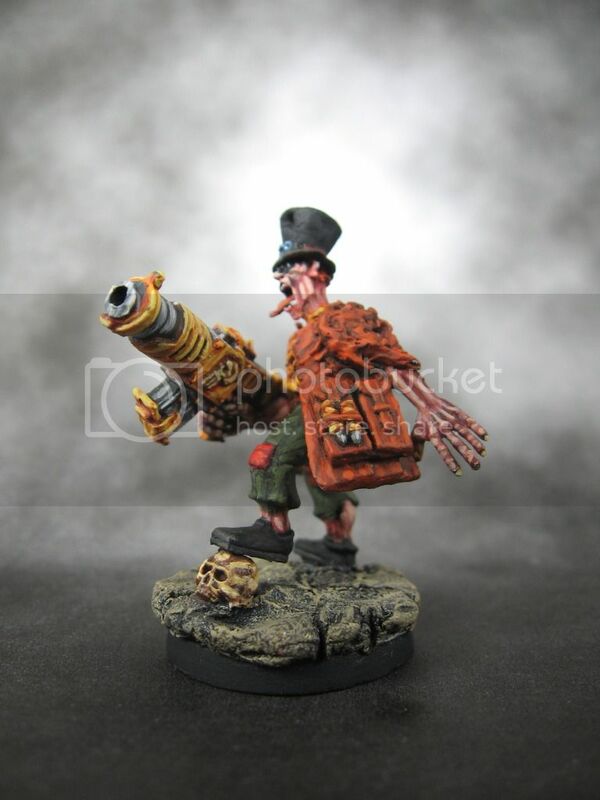 I would say that he is a bit of a legend on Tom's Boring Mordheim forum. To make a long story short, the prisoner I received is from DeafNala. He built me a beautiful chaos renegade model to add to my imperial renegade squad. Enough blabbering though, the pictures tell the true story. The prisoner came with a wonderful diorama. 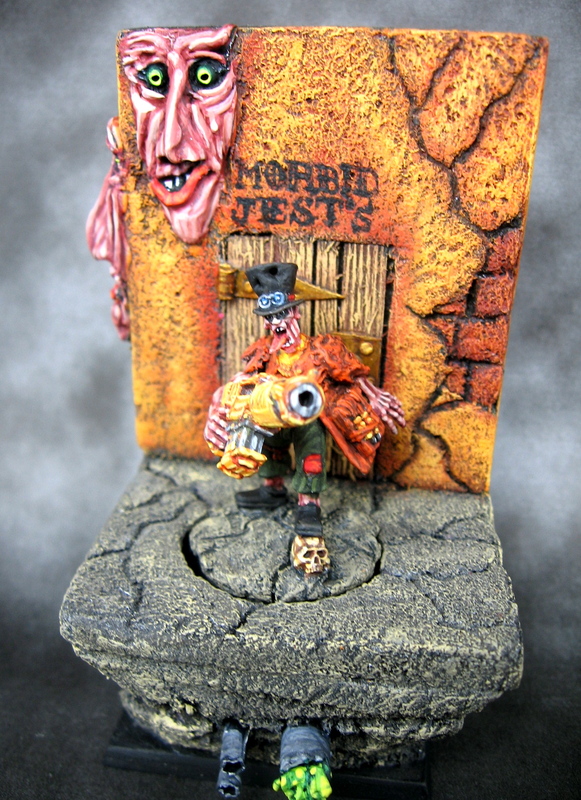 The renegade is outside Morbid Jest's, a puub that I believe is located in the creepy table he is currently building. The diorama includes some of DeafNala's trademark creepy faces. The detail on the diorama is fantastic. Hinges on the doors, the cracks in the pavement, exposed brickwork. The finish is also superb. The base even includes a few pipes with effluent coming out. Not sure if this was intentional, but many of my renegades have similar features on their bases. The model itself has a ton of character. I only know where some of the bits come from. If you would like to see some WIP shots of the model, check out the thread at the DS forums. I am absolutely thrilled with the prisoner I received. Thank you so much to DeafNala for producing such a wonderful piece. I am so impressed by the quality, finish, and character of this diorama. The bold colours and strong contrast in the highlights are something I will definitely try on some of my future models, and this model will serve as a great inspiration. I can't say enough great things about the model and how grateful I am to receive it. I wanted to do the prisoner exchange as a chance to push myself as a modeller and build something for someone else. To receive such a beautiful model as a gift from someone I have not even met in real life is an honour and very touching. It is wonderful how through this event and forum people have been brought together in a small way across the world. Thank you DeafNala for this wonderful model. 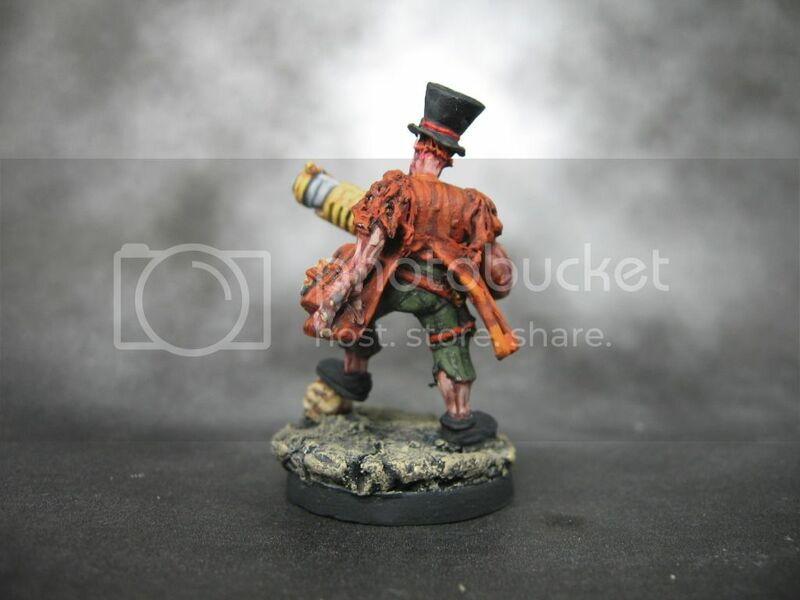 I've primed and painted the first coat onto my prisoner. My spray can primer ran out so I primed the model using white airbrush primer. I then airbrushed the whole model black then layered zenithal highlights using US Grey and Light Grey from the Vallejo Model Air range. 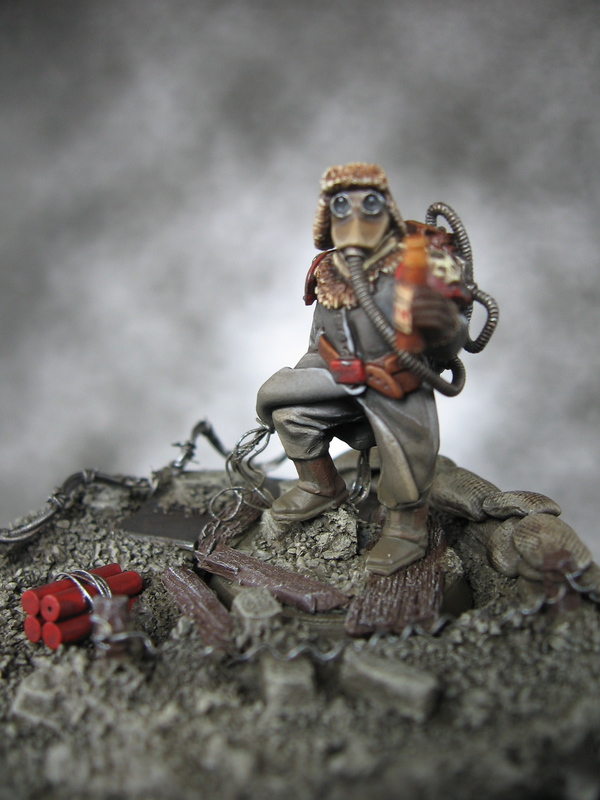 To finish the greatcoat I will add some shading in the folds using either glazed washes or wet blending. Sine you last saw the model I added some shoulder pads and a Dragon Forge cable from the mask which goes to the canister below the backpack in the back. There is lots of work still to go on this model. 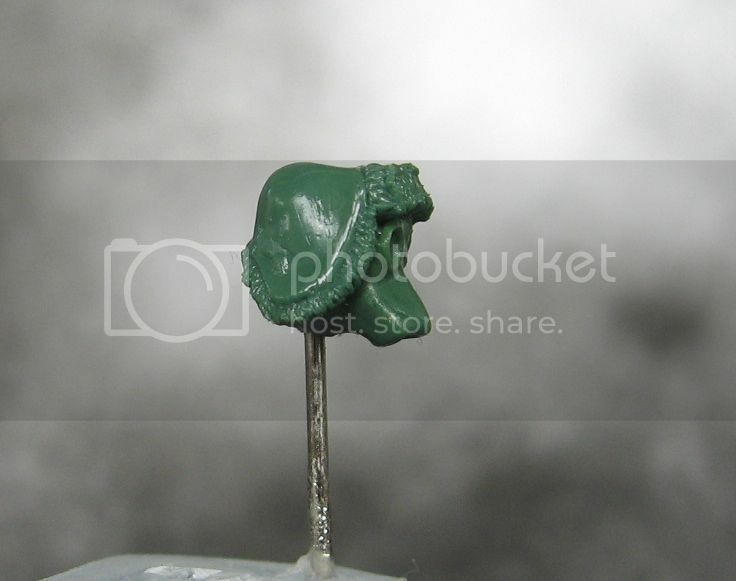 Getting a model built, converted, sculpted, primed, and airbrushed is the biggest hurdle. Now I just need to add all of the detail. I have the recipe planned out so I am hoping to make reasonably fast progress. Ideally, the model will be finished by the end of the weekend so I can post it off to its recipient early next week. 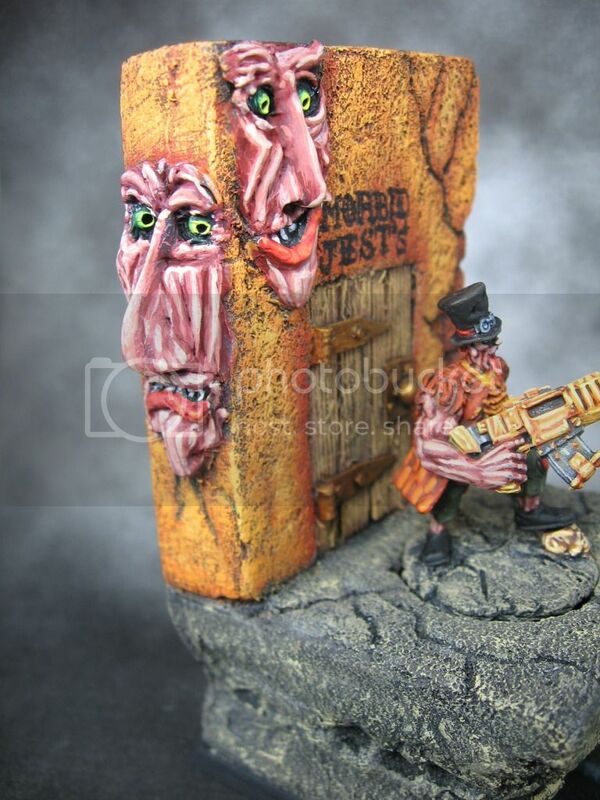 I've finished some more work on the sculpting of my demolition expert prisoner. It is slow going as I am trying to be patient and let each layer set before adding detail on top. This is definitely the most challenging sculpting I have done so far. I am curious to see how it will look painted up. 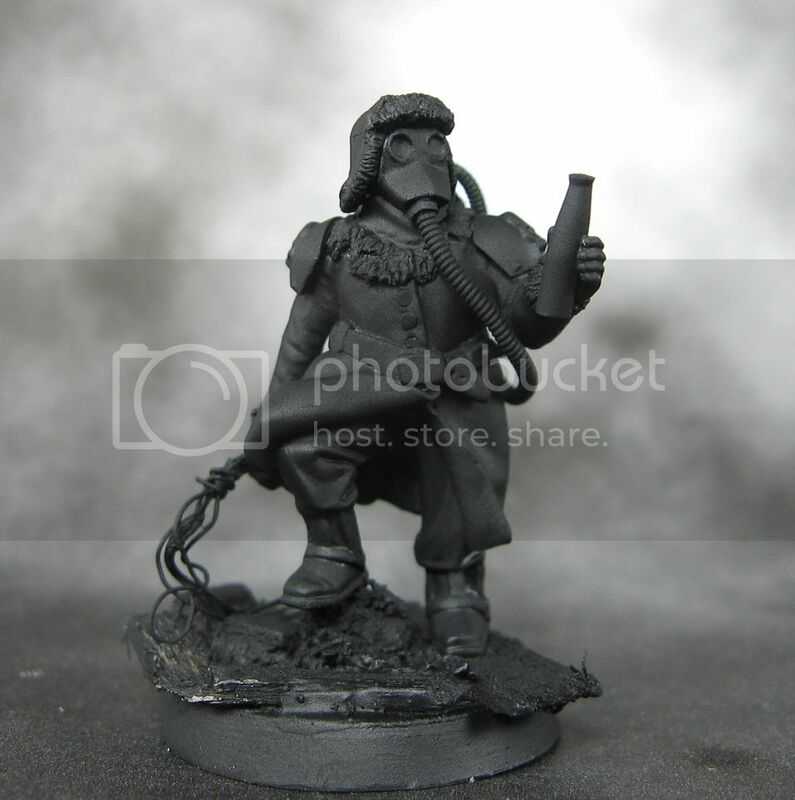 I think the mark of a good sculpt or conversion is that at first glance you can't really tell what is the original model and what is sculpted. With this much sculpting I think it will be challenging to reach that standard. I've posed him holding a bottle and a trip wire. I imagine he is resting after setting a trap when he hears an explosion in the distance. The head is probably my favourite bit so far. Update: I added shoulder pads. The shoulder pads make him much more intimidating in my opinion. I've finished a bit more of the sculpting and converting for my prisoner. I was away for a few weeks due to a family commitment (hence the lack of posts). I am back now though and should continue with regular content. This conversion will maybe be the most complex sculpting I have done. Mostly just because I find cloth fairly challenging and I am trying to build up detail through multiple layers. 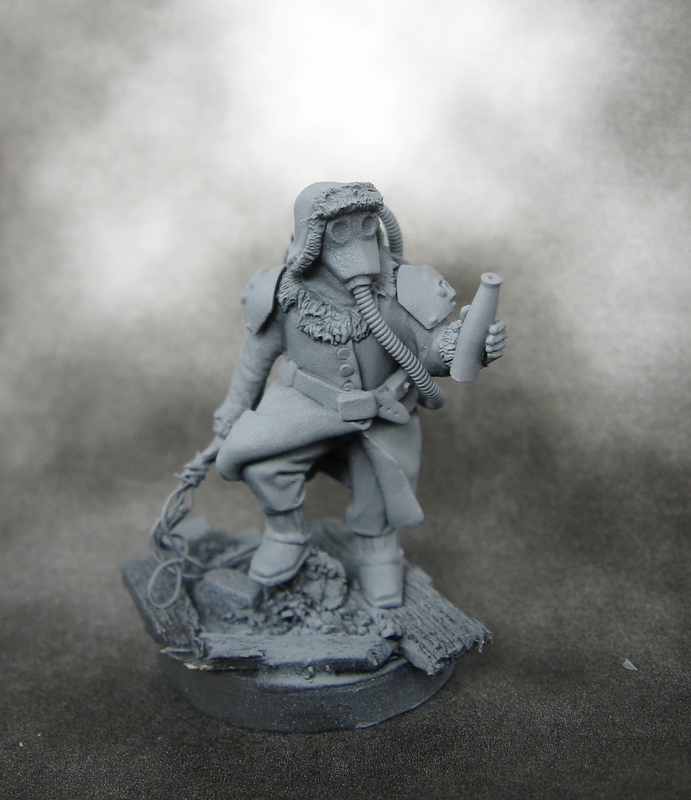 When finished the model will have a fur lined greatcoat, a gas mask, and a fur hat. Nothing crazy, but definitely challenging. 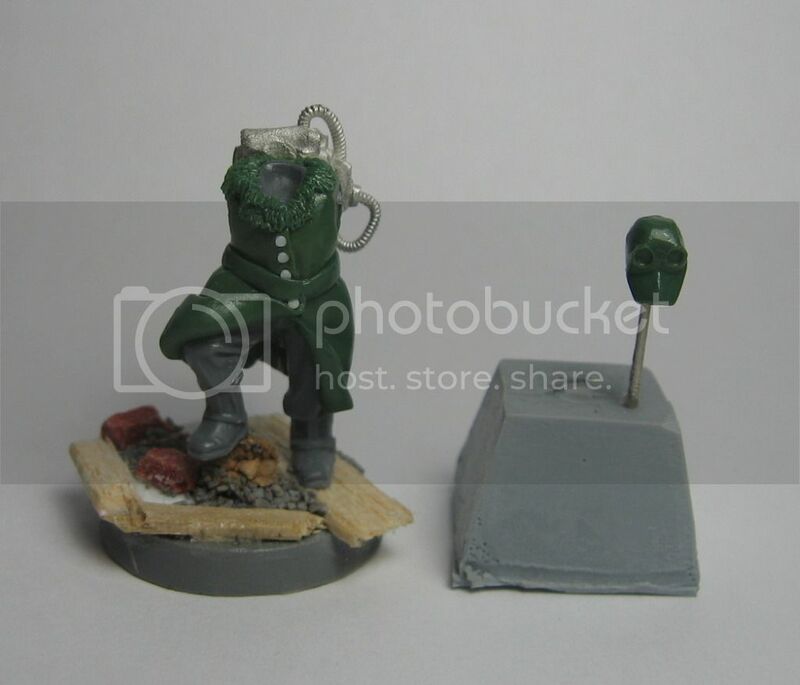 The first step was to make the basic shape of the greatcoat over the legs and torso. After that I added the belt and fur collar a day later. I started on the mark by filling most of the detail off the head. I then made two flat circles, let it set, and then made the outside of the lens. I then sculpted the mask once it had set. Once this is hardened I will add a fur hat on the top and a pewter cable at the bottom. I also added a little more detail to the traps. I still have a fair bit of detail (and arms!) to add. I need to finish this model quickly, so expect to see the finished conversion up here soon. Welcome to gubnutz, brovatar, Marcin, and tony.